The Boeing 747 is a jet airliner. It is made by Boeing Commercial Airplanes. The Boeing 747 has more than one aisle, which means it is a wide-body aircraft. It is often called the Jumbo Jet or Queen of the Skies. The Boeing 747 is one of the easiest planes in the world to recognise. It was the first wide-body aircraft ever made. The first type of 747 was two and a half times the size of the Boeing 707. The Boeing 747 made its first flight for an airline in 1970. 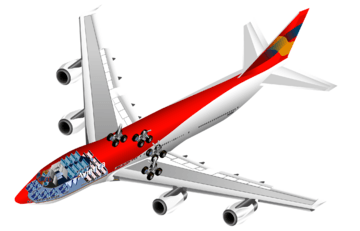 The 747 could carry more people than any other aircraft for 37 years, until the Airbus A380 was made. The 747 is a double deck plane. It can carry people, cargo and many other things. Boeing designed the 747's upper deck to be a first class lounge or just extra seats. 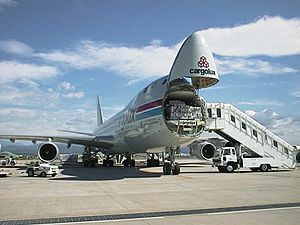 They also designed the upper deck so that the aircraft could be changed into a cargo plane easily. This was done by removing seats and putting in a cargo door at the front of the plane. Boeing did this because they thought that supersonic airliners would become much more popular than the 747 and other subsonic airliners. However, they thought that subsonic cargo planes would always be popular. It was thought that the 747 would become unpopular after 400 were sold. However, 1,000 planes had been made by 1993, so it stayed popular. By September 2012, 1,448 aircraft had been built. 81 747-8s were still waiting to be built. The 747-400 is one of the fastest airliners being used today. It usually flies at Mach 0.85–0.855 (up to 570 mph, 920 km/h). It can fly for 7,260 nautical miles (8,350 mi or 13,450 km). The newest version of the 747, the 747-8, is now being made. The 747 will be replaced by the Boeing Y3 (part of the Boeing Yellowstone Project) eventually. In 1963, the United States Air Force began to look for a very big plane to transport things. At that time, the C-141 Starlifter was being used. However, the Air Force thought that a much bigger plane which could carry more cargo was needed. The Air Force called the big plane the CX-Heavy Logistics System (CX-HLS). It needed to be able to carry 180,000 pounds (81,600 kg) of cargo and travel at Mach 0.75 (500 mph or 805 km/h). It also had to be able to fly for 5,000 nautical miles (9,260 km) while carrying 115,000 pounds (52,200 kg) of cargo. The cargo bay had to be 17 feet (5.18 m) wide, 13.5 feet (4.11 m) high and 100 feet (30.5 m) long. There had to be doors for the bay at the front and the back of the plane. The Air Force also wanted the plane to have only four engines. This meant that new engines had to be made. On May 18, 1964, Boeing, Douglas, General Dynamics, Lockheed and Martin Marietta designed a plane. General Electric, Curtiss-Wright and Pratt & Whitney designed the engines. The Air Force liked Boeing, Douglas and Lockheed's designs. They also liked General Electric and Pratt & Whitney's engine designs. In 1965, Lockheed's plane and General Electric's engines were used for the C-5 Galaxy. At that time, it was the biggest military cargo plane in the world. The idea for the 747 was thought of in the 1960s. Jets like the Boeing 707 and Douglas DC-8 had made it easy to travel long distances. Juan Trippe from Pan American World Airways (Pan Am), asked Boeing to build a plane which was more than two times bigger than the Boeing 707. At this time, airports were very busy. Trippe thought that a big plane could help make them quieter. In 1965, Joe Sutter was told to design this new plane. It was called the 747. Sutter asked Pan Am and other airlines what they would like from the plane. At the time, it was thought that supersonic aircraft would replace the 747. Because of this, Boeing made the 747 so that it could easily be turned into a cargo plane if the passenger version became less popular. In April 1966, Pan Am bought 25 747-100 planes. The order cost US$525 million. Since Pan Am was the launch customer, Pan Am had a big say in the design and making of the 747. No other airline before then or since then has been able to have so much influence over a plane. The design that Boeing made for the Air Force in 1963 was not used for the 747. However, Boeing made some new things for the Air Force which were used in the 747. The first design had two full decks. However, in 1966, this was changed to only one deck. The cockpit was put above the deck, which made a "bulge". There was a small space behind the cockpit which people could sit in. At first, it was a "lounge" area with no seats. The Pratt & Whitney JT9D turbofan engine was made for the 747. Planes as big as the 747 needed high-bypass turbofan engines. High-bypass turbofans could make twice the power of turbojets. It also used a lot less fuel. General Electric made the first of these engines. However, it was making the engines for the C-5 Galaxy. It did not make engines for airliners until later. Pratt & Whitney was also working on this type of engine. In 1966, Boeing, Pan Am and Pratt & Whitney designed a new engine, the JT9D, for the 747. Boeing used some special devices to make the plane make more lift. This was done so that the 747 could take off from shorter runways. The 747 has a lot of flaps on the wing. The flaps make the wings bigger by 21 percent. They also make 90 percent more lift when they are used. Boeing tried to give the 747 to Pan Am by the end of 1969. This meant that Boeing only had 28 months to design the aircraft. The people who worked on the 747 had the nickname "The Incredibles". Boeing did not have a factory big enough to make the new plane. Boeing thought about putting their factory in 50 different cities. They eventually decided to build their factory in Seattle, near Everett, Washington. Boeing bought the factory in June 1966. Designing the 747 was very difficult. Building its factory was also not easy. Boeing's president, William M. Allen, asked Malcolm T. Stamper to be in charge of the building of the Everett factory. He was also asked to begin building the 747. The factory is the biggest building ever built (by volume). It has been made bigger many times so that Boeing can build even bigger planes. Before the first 747 was put together, parts and systems were being tested. In one important test, 560 volunteers evacuated a replica of a 747 cabin using the emergency chutes. The first evacuation took two and a half minutes. However, the FAA says that the maximum time for an evacuation is 90 seconds. Many of the volunteers were hurt. More evacuations happened, and they eventually reached the 90 seconds. However, they also caused a lot of injuries. Evacuating from the top deck of the plane was difficult. Instead of using the usual slides, the volunteers had to leave the plane using a harness. The plane's taxiing also had to be tested. Boeing made "Waddell's Wagon" (named after a 747 test pilot, Jack Waddell) to train the pilots. "Waddell's Wagon" was a replica of a 747 cockpit which was put on the roof of a truck. This helped pilots to learn how to taxi the plane. On September 30, 1968, the first 747 was finished. People from the 26 airlines that had ordered the 747 were also there. The 747 first flew on February 9, 1969. Its pilots were Jack Waddell and Brien Wygle. There was a small problem with the flaps, but the 747 handled well. 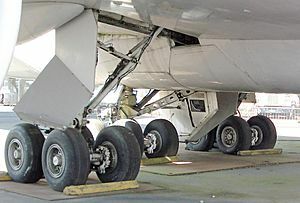 The prototype 747's main undercarriage. It has 16 wheels. The testing was delayed because of some problems with the JT9D engines. For example, the engines stalled if the throttles were moved too quickly. This meant that 747s could not be delivered for many more months. 20 planes were stuck at the factory while they were waiting on engines. On December 13, 1969 the test plane was being taken to have some changes made to it. The pilot, Ralph C. Cokely landed too early and did not reach the runway. One of the landing gears was ripped off, and two of the engines were damaged. However, Boeing took the 747 to the 28th Paris Air Show in mid-1969. There, the public saw the 747 for the first time. 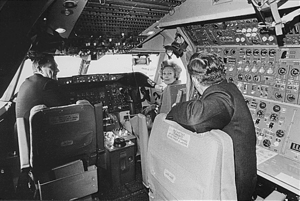 First Lady Pat Nixon in a 747 cockpit on January 15, 1970. Designing the 747 and building the new factory cost a lot of money. This meant that Boeing had to borrow a lot of money from a bank. Just before the first aircraft was finished, Boeing had to keep asking for more money. If Boeing was not given this money, the company could have collapsed. Boeing was in over $2 billion in debt. Allen said, "It was really too large a project for us." However, the 747 program was a success. Boeing was the only company to make very big planes for many years. The very first time a 747 was used by an airline was on January 22, 1970. Pan Am used it to fly from New York to London. The flight was supposed to happen on the evening of January 21. However, the engines on the aircraft overheated. Pan Am had to find another plane, which took six hours. The 747 did quite well when it first began to be used. Some people thought that airports would not be able to handle such a big plane. However, they could. There were some problems, but they were quite small and they were fixed quickly. After Pan Am began to use the plane, other airlines began to use their 747s. Boeing thought that a lot of 747s would be sold because airlines wanted a plane which could fly for a long time, not because it was so big. The recession of 1969-1970 was very bad for Boeing. For over a year after September 1970, it only sold two 747s. None were sold to an American airline for over three years. Some airlines did not have enough passengers to fly the 747. Therefore, they replaced them with the McDonnell Douglas DC-10 and Lockheed L-1011 TriStar. American Airlines eventually only used its 747s to carry cargo. In 1983, AA gave its 747s to Pan Am. Pan Am gave American Airlines some smaller planes. Delta Air Lines also stopped using its 747s after many years. Delta would later merge with Northwest Airlines, which operates 747s. Flights which landed in smaller cities became quite usual in the 1980s. This was bad for the 747. However, many airlines still used the 747 to fly across the Pacific. The first type of 747 was called the 747-100. After this, Boeing made the −100B, which has a higher MTOW (maximum takeoff weight), and the −100SR (Short Range). The -100SR could carry more passengers. A higher MTOW means that the plane can carry more fuel and fly further. In 1971, Boeing made the −200. It had better engines and a higher MTOW. Airliner and cargo versions of the −200 were made. The 747SP (special performance) was also made. It began being used in 1976. In 1980, Boeing made the 747-300. The first 747-300 was made in 1983. Its upper deck was longer, it flew faster and it could hold more passengers. The −300 was first called the 747SUD for "stretched upper deck". Then it was called the 747-200 SUD, then the 747EUD, and finally it was called the 747-300. The 747-400 began being used in 1989. 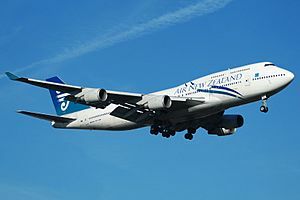 Air New Zealand was one of the first airlines to use it. In 1985, Boeing began to design the 747-400. This type has a glass cockpit. This meant that only two people were needed in the cockpit. It also had new engines and a new cabin. 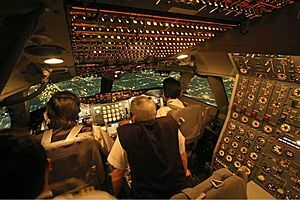 The workers who made the 747-400 were not very experienced and Boeing wanted them to work for longer than they needed to. This meant that there were some problems with the first 747-400s. The −400 began being used by airlines in 1989. In 1991, 1,087 passengers were taken to Israel on a 747. This was a part of Operation Solomon. The Antonov An-225 cargo transport is the world's biggest plane. The Hughes H-4 Hercules has the biggest wingspan, but it only flew once. Since the 747-400 was made, many more types of 747 have been suggested. Boeing said that they would make the 747-500X and -600X in 1996. These new planes would have cost more than US$5 billion to design and make. Airlines did not like it enough, so Boeing decided not to make the planes. In 2000, Boeing said it would make a 747X to rival the Airbus A3XX. However, airlines did not like the 747X enough, so it was cancelled. A year later, Boeing began concentrating on the Sonic Cruiser. The Sonic Cruiser was stopped, so Boeing then focused on the Boeing 787 Dreamliner. Some of the ideas that Boeing had for the 747X were used on the 747-400ER. In 2004, Boeing said that it might work on the 747 Advanced. Boeing decided to go ahead with this. The 747 Advanced used some things from the 787 to make the 747's design more modern. The 747 was the world's biggest passenger plane until the Airbus A380 was finished in 2007. On November 14, 2005, Boeing said it had changed the name of the 747 Advanced to the Boeing 747-8. The last 747-400s were made in 2009. On February 8, 2010, the 747-8 Freighter made its first flight. Cargolux got the first 747-8 in 2011. Eventually, the 747 will be replaced by "Y3". The Boeing 747 is a big, wide-body airliner. It has four engines on the wings, and the wings are swept at 37.5 degrees, so the 747 can fly very fast. The sweep also means that the 747 does not need any special hangars. Cargolux 747-400F with the cargo door open. Since the cockpit is above the main deck, it makes a "hump", and because it is so high, the plane can have a cargo door installed at the front. The 747-100 can fly for 5,300 nautical miles (6,100 mi, 9,800 km), and the 747-8i can fly for 8,000 nmi (9,200 mi, 14,815 km). The 747 has special flaps, which allow the 747 to fly slowly and land on normal runways. A 747 can carry a fifth engine on the wing, but it cannot be used. The 747-100 was the very first type of 747, which was made in 1966. The 747-200, the next version, was made in 1968. The 747-300 was made in 1980 and the 747-400 was made in 1985. 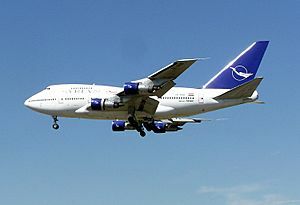 The newest version, the 747-8, was announced in 2005. These types also have smaller sub-types. The International Civil Aviation Organization (ICAO) names these planes by combining the model number of the plane with its type number. For example, the 747-100 is "B741" and the 747-400 is "B744". 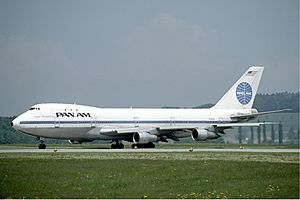 Pan Am was the first airline to use the 747. 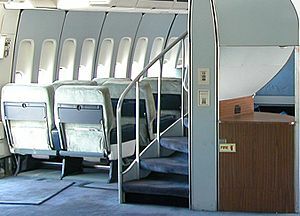 The first 747-100s had six windows on the upper deck. Later, airlines began to use the upper deck to hold more people instead of using it as a lounge. Boeing then made an upper deck with ten windows. 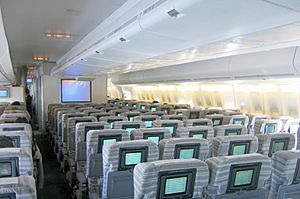 Some −100s had the new ten-window upper deck installed after the plane was made (retrofitted). The −100 had Pratt & Whitney JT9D-3A engines. Boeing did not make a freighter version of the 747-100, but some airlines have turned some 747-100s into freighters. 167 747-100s were made. After Japanese airlines requested an aircraft to fly routes between major cities in Japan, Boeing produced the -100SR. This model flies shorter distances, but is able to carry more passengers. The first -100SR started flying with Japan Air Lines (JAL) on October 7, 1973. The -100SR had four General Electric CF6-45A2 or Pratt & Whitney JT9D-7A engines. A total of 7 -100SR were produced. Later, Boeing designed a type of -100SR with the ability of taking off with greater weight. This was the -100BSR. It was first delivered to All Nippon Airways (ANA) on 21 December 1978. 20 -100BSR were delivered to JAL and ANA. In 1986, 2 -100BSR with stretched upper deck (SUD) from the -300 series were delivered to JAL. It was the last -100SR/BSR ever built. 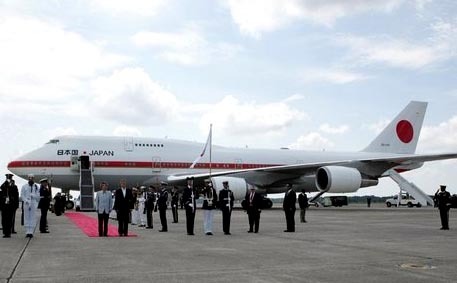 The last delivery was to JAL, in September 1986. There were a total of 29 -100SR/BSR made. The 747SP (SP means special performance) is designed as Pan Am and Iran Air both wanted a wide-body plane that can fly long distances; from New York to the Middle East (for Pan Am) and Tehran to New York (for Iran Air). The first 747SP was produced on 19 May 1975. Its first flight was on 4 July. On this flight, it flew at a top speed of Mach 0.92 (1,127 kilometres per hour or 700 miles per hour). It started flying people on 25 April 1976, after being delivered on 5 March. Now, it is not often used. A total of 45 747SP were made and used by airlines like Qantas, China Airlines, Air China and South African Airways. 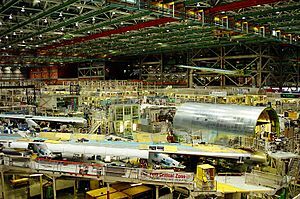 After the -100 were made, Boeing started making -200. The -200 has a longer range, but still carries the same number of people. This is because airlines said the -100 could not fly long distances. The -200 is made in passenger type (-200B), freighter type (-200F), Combi type (A plane that carries both cargo and people; -200M) and convertible type (a plane that can be easily changed to carry cargo; -200C). The first -200B was finished on 10th September, 1970 before its first flight on 11th October and finally, it started being used by KLM. Boeing then started making the other types of -200. The -200F first flight was on November 30, 1971, 7 days after it was finished. It was then delivered to Lufthansa. The -200C first flew on March 23,1973 before being delivered to World Airways in May the same year. Finally, the -200M had its first flight on November 11, 1974 before being delivered to Air Canada. There was a total of 393 -200 series ever made,which includes 225 -200B, 78 -200M, 73 -200F, 13 -200C and 4 military. Front view of a British Airways Boeing 747-400 arriving at London Heathrow Airport in 2015. The triple-slotted trailing edge flaps are well seen. The 747-400ER was derived from the 747-400X study. Diagram of Boeing 747 variants.At the top: 747-100 (dorsal, cross-section, and front views). Side views, in descending order: 747SP, 747-100, 747-400, 747-8I, and 747LCF. A retired Boeing 747-100 of Evergreen International Aviation on the roof of the Wings and Waves waterpark in McMinnville, Oregon. Boeing 747 Facts for Kids. Kiddle Encyclopedia.